England showed their demolition of Ireland was no fluke by crushing France 44-8 at Twickenham to remain unbeaten in rugby’s Six Nations. Coach Eddie Jones promised England would be even better after upsetting the reigning champions in Dublin on the opening weekend, and his men were merciless in their biggest win against France in 108 years. 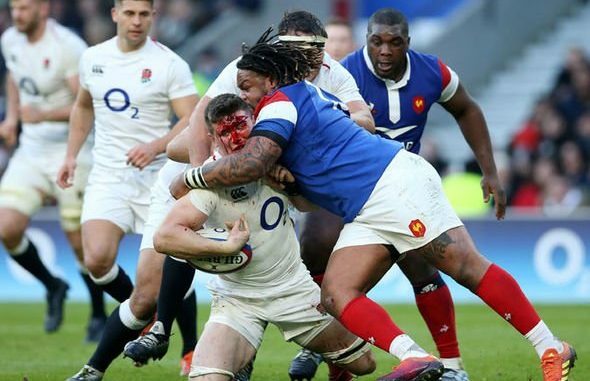 Where England overwhelmed Ireland with power and pressure, this time they showed savvy and smarts to pickpocket the French with chip kicks and grubbers. France weren’t that bad. But the decision to put two centres on the wings, and a wing at fullback, was ruthlessly exposed as three of England’s four tries in the first half came from expertly weighted kicks in behind the defence where no blue jerseys were anywhere near. Ireland kept their Six Nations title defence alive at Murrayfield by grinding down Scotland 22-13 on Saturday. After being crunched by England on the opening weekend in Dublin, Ireland had to rebound far from home against a Scotland side confident it had the steel and flair to end Ireland’s championship reign in the second round. But after a breathless first half which the Irish edged 12-10, they scored a third soft try for some breathing room and their defense limited Scotland to just a penalty. Wales equalled their century-old national record for consecutive wins after overcoming a plucky Italy side 26-15 in the Six Nations. Italy scored the only try of the first half to trail 12-7 at halftime and Wales didn’t score a try until the 53rd minute and finished with only two, but it was enough to notch an 11th successive victory, tying the Welsh record set 109 years ago. The Italians extended their own record streak with a 19th straight defeat in the Six Nations since 2015. The 99-year-old tournament record became theirs outright last weekend in Edinburgh.